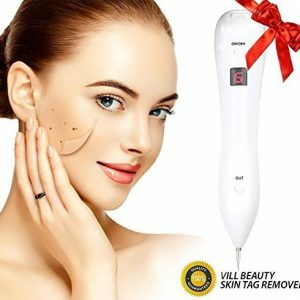 【Ultrasonic Vibration for Muti-function】 Advanced SONIC VIBRATIVE cleaning technology with 333 times vibrations per second for deeply facial cleaning.11x better removal of long-wear makeup and 30x better cleansing of age-accelerating pollution than hands alone. Great to remove blackheads,minimize clogged pores,exfoliate dead skin,will brighten your complexion by long term use. 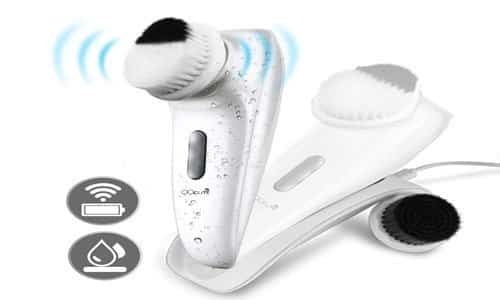 【IPX7 Waterproof & Wireless Convenient Inductive Charge】100% waterpoof design ideal for usage in the bath which is perfect for Facial and Body cleansing. You can freely to clean your neck, back, hands and legs in the shower. Charged with an inductive charging base. Just put the device on the charging cradle and plug in, the device will be on charge. 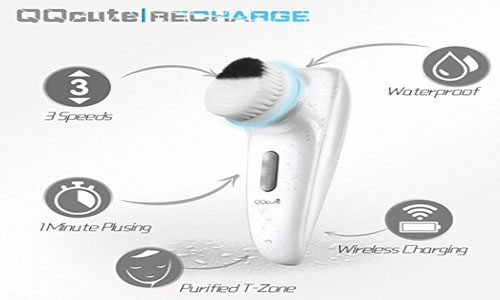 【2 Modes & 3 Speed Setting for Different Needs】There are Continuous and Pulse modes with Strong, Middle and Low speed setting for all skin types and needs. Each way convey different vibration modes and speed to specifically clean and massage your skin. 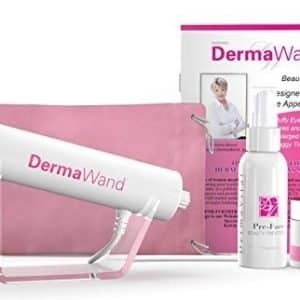 It can deliver superior cleansing on hard-to-remove makeup, promote blood circulation, perfect acne treatment for sensitive skin. 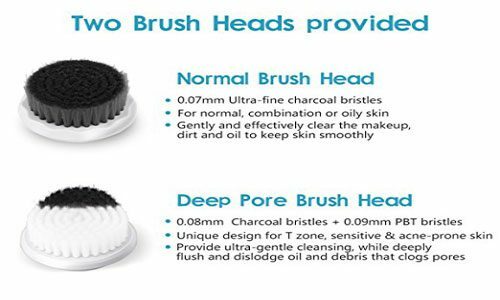 【2 Brushe heads Super Soft with Ultra-fine Bristles】One Normal Brush Head with charcoal bristles suitable for all skin types, delivers daily deep cleansing and gentle exfoliation to renew youthful skin. 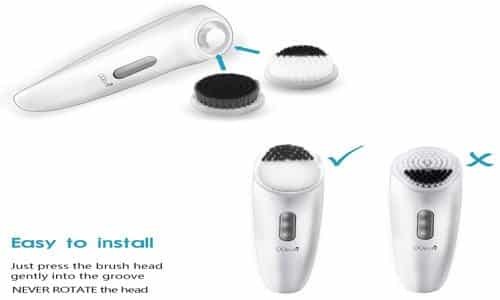 Another Brush Head combined with two different ultra-fine bristles for sensitive skin and T zone, deliver superior cleaning on hard-to-remove makeup in T zone and perfect acne treatment for sensitive skin. 【Non-volatile Memory Function & QQcute Warranty】Turn on the unit, the mode will be the same as that of last use. FULL REFUND Guarantee & REPLACEMENT warranty in one year to ensure excellent customer experience.